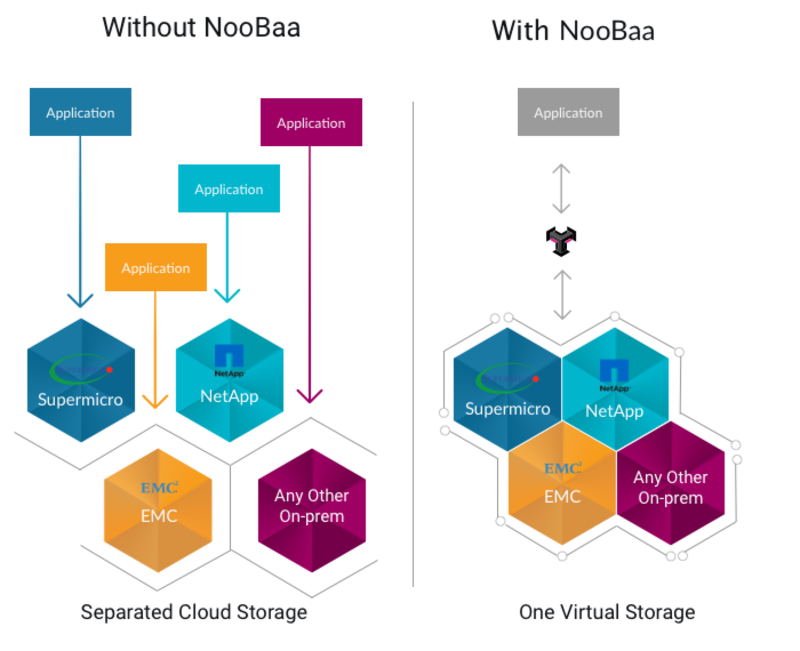 Embrace Cloud Flexibility and Agility in Your Data Centers. Scale storage quickly and store data anywhere you need. Storage silos exist in most data centers today, making it complex and costly to manage. By nature, each silo enforces its own lifecycle, scale, hardware refresh, and limitations. NooBaa introduces a totally different experience, turning your existing storage infrastructure into a private cloud with built-in agility and flexibility. It eliminates the limitations on scaling and geographic data distribution and the pain of migration and hardware refresh. With AWS S3 compatibility and hardware-agnostic technology, NooBaa lets you easily aggregate multiple storage silos of any size and vendor. NooBaa’s unique architecture lets you scale storage quickly and store data anywhere you need. You can even create your own availability region with just one click. How Does NooBaa’s Private-Cloud Works? NooBaa's private cloud solution let customer focus on scale and not migration projects. NooBaa simply turns any Linux or Windows server, with any capacity, into a storage node. When data is written to NooBaa's endpoint, a process of deduplication, compression and encryption will take place, and multiple data chunks will be distributed to storage nodes and stored on multiple drives, using the NooBaa bucket data resiliency policies and data placement policies. The data resiliency policies determine how many full replicas will be created for every object in a bucket, or alternatively, what will be the erasure coding used for each object. The data placement policies determine the physical location of each object, which can spread the data over the storage nodes or mirror data between racks, data centers or even a cloud tier. NooBaa will prioritize local data writes, when possible, and will mirror or spread the data to remote locations in the background. How is NooBaa different from other solutions?